For 300 days, Martin Luther hid out in the mountaintop fortress of Wartburg while translating the Bible into German. You can visit the rooms where he worked and slept. ABOVE: A view of Wartburg Castle in Eisenach, Thuringia. It's old. Wartburg Castle was founded in 1067, and its central structure dates back to the 12th Century. By comparison, Neuschwanstein in Bavaria--which was inspired, in part, by the Wartburg--is a modern fairy-tale confection from the late 1800s. It's imposing. Wartburg Castle looks like a fortress, even though it was never used for military purposes. It's perched on a mountaintop. Or at least a hilltop: The castle is 410 meters or 1,230 feet above sea level, which is 220 meters or 722 feet higher than the town which it overlooks. It's historic. 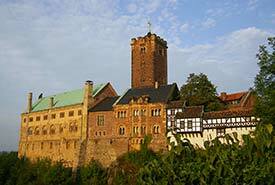 Martin Luther hid out in Wartburg Castle for 300 days in 1521-1522 after being declared an outlaw and a heretic at the Diet of Worms, and he translated the Bible into German during his stay. Another famous German, the poet Johann Wolfgang von Goethe, spent five weeks at the Wartburg in 1777. It's romantic. Parts of the castle were transformed into a fantasy of mosaics, frescoes, and other expressions of German Romanticism from 1838 to 1890, and Wagner set Tannhäuser--officially titled "Tannhäuser and the Singers' Contest at Wartburg"--in the castle and its surroundings. It's on UNESCO's World Cultural Heritage List. The castle received its blessing from UNESCO in December, 2009. In light of these characteristics, it shouldn't be surprising that Wartburg Castle draws many thousands of tourists and Protestant pilgrims annually. It's also a musical and preaching venue, with operatic performances, chamber music, blues, jazz, Christmas music, and religious services in the Festival Hall or Castle Chapel during the course of the year. There's even a Weihnachtsmarkt on the weekends before Christmas. A trip to Eisenach simply isn't complete without a visit to the Wartburg. Fortunately, the castle is easy to reach from town (whether by public transportation or car), and it's open to visitors year-round. For practical advice, including tips on reaching Wartburg Castle by car or public bus, read the Wartburg Castle visitor information on page 2. Also see the captioned pictures in our Wartburg Castle photo gallery.